In "Beyond Fear" psychotherapist Dorothy Rowe speaks of the "fear of annihilation of self" as the ultimate human fear. This is what we mean by "terror" and "being terrified" - the fear so much harm may be done to ourself or our interests that we will cease to have any meaningful life experience or - perhaps worse! - that we will be propelled into a state of endless overwhelming suffering. Although we usually look to external events, people or situations for the cause of our terror, in fact the person most likely to terrify us - sometimes on a quite frequent basis! - is ourself! - our fearful imaginings, horror fantasies, nightmare dreams, or the images we have taken into brains from films, computer games, TV News or other media experiences. "In real life, Men are sometimes too MUCH addicted to pity or fear - and sometimes too LITTLE. Tragedy [in drama] brings them back to a virtuous and happy mean." Lessing saw 'watching tragedy unfold' as an emotional re-balancing experience - that through observing tragedy, people re-learn, via either cathartic release, or emotional awakening, how to feel and engage with these emotions at natural levels. He saw emotional catharsis [such as when a community comes together to mourn] as a 'purification' - an experience that brings pity/compassion and terror/fear into their proper balance. Total soul loss, i.e. completely forgetting our spiritual origin, spiritual connection, spiritual identity, spiritual guidance and spiritual nature, results in the emotional experience of terror on the part of people who feel they are potential targets of personal violence. When people are consumed by hatred or desperation they lose connection to their soul (spiritual nature) and begin to seek a delusional freedom from negative emotions via committing acts of terrorism. Terrorists are soul-less individuals who have consciously or unconsciously slid down the slippery slope of unfettered destructiveness including self-destructiveness, for as the Chinese proverb reminds us "He who seeks revenge should dig two graves!" we can extend this into "The person who seeks to separate another from their soul identity (i.e. terrify them), will lose their own soul. Once we really know that we are essentially a soul rather than our physical body, possessions or attachments, and once that we understand ("know" inwardly) the fundamental rules of the universe such as the Law of Opposites (yinyang), The Law of Attraction and the Law of Karma (we reap what we sow), terror can never fully and persistently hold us in its icy (terror "freezes" us so that we cannot follow our natural soul/spirit/fulfilment path) grip. Similarly, once we really know that we are part of an indestructible cosmic consciousness (in the Hindu religious tradition they call this "self-realization", Buddhists call it "enlightenment", the early Christians called it "Gnosis", New Age seekers call it "The Experience of Universal Oneness", in the Shamanic traditions they say "All Things are Connected") we much less easily become terrified or vulnerable to either "freezing up" or reactive "counter-terrorism terrorism" (according to the principle of "like begets like" i.e. "victims become abusers" - abuse spawns abusive counter-measures). The great spiritual truths in all the major religions is that a) we are eternal beings - our consciousness is fundamentally indestructible, b) there are balancing dynamics and protective forces in the universe which ensure that we will not "suffer endlessly" or be "totally destroyed". 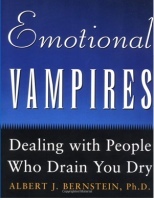 Emotional Vampires: Deal With People Who Drain You Dry! Think their needs are more important than yours . Believe "the rules" apply only to other people . Use their tempers in the same way terrorists use bombs. "Emotional Vampires..." tells readers how to spot a "vampire" in their lives, which defense strategies to employ to prevent one from striking, and what to do if and when they find themselves under attack. Actually, terror can be an important doorway into spiritual truth and awareness. Spiritual truth and awareness are the best defences, maybe the only real defences, against being terrified or behaving in desperate, aggressive or vengeful ways that encourage more acts of terrorism against us - including self-terrifying thoughts, feelings, addictions and behaviours.